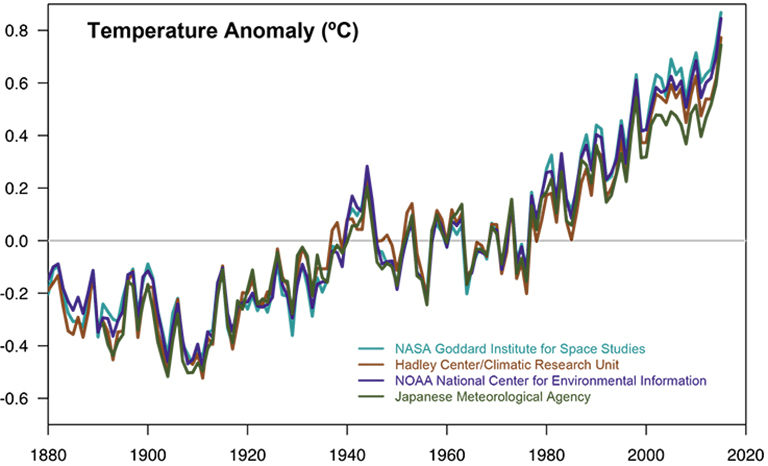 Most leading scientific organizations worldwide have issued public statements endorsing the position that climate-warming trends over the past century are extremely likely due to human activities. Multiple studies published in peer-reviewed scientific journals1 show that 97 percent or more of actively publishing climate scientists agree: Climate-warming trends over the past century are extremely likely due to human activities. In addition, most of the leading scientific organizations worldwide have issued public statements endorsing this position. The following is a partial list of these organizations, along with links to their published statements and a selection of related resources. Climate change is real. There will always be uncertainty in understanding a system as complex as the world’s climate. However there is now strong evidence that significant global warming is occurring. The evidence comes from direct measurements of rising surface air temperatures and subsurface ocean temperatures and from phenomena such as increases in average global sea levels, retreating glaciers, and changes to many physical and biological systems. "The evidence is incontrovertible: Global warming is occurring. If no mitigating actions are taken, significant disruptions in the Earth’s physical and ecological systems, social systems, security and human health are likely to occur. We must reduce emissions of greenhouse gases beginning now." The following page lists the nearly 200 worldwide scientific organizations that hold the position that climate change has been caused by human action. The following page contains information on what federal agencies are doing to adapt to climate change.